Vienna is the capital and largest city in Austria. It's also the cultural and economic center for the country, so it has a lot to offer visitors. The historic city center is a UNESCO World Heritage Site, and the city has a rich history and impressive culture with a focus of music and art. Because Vienna is a large city, make sure you understand where your hostel is located. Consider which part of the city you'd like to base yourself, and find a place in or near that neighborhood. If you can find an affordable option withing the central part of the city, at least make sure it is very close to an underground or tram station. Even so, it is worth paying more to stay in the city center. 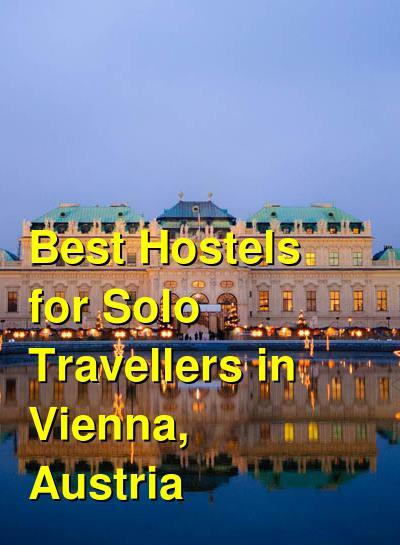 How much do hostels in Vienna cost? Wombats is a chain of hostels with locations throughout Europe and several locations in Vienna. This particular hostel is located at Vienna Naschmarkt and is near public transportation and conveniently close to many sights and attractions around town. The hostel is a popular option in the city and has a good reputation for being a fun and friendly place to stay. If you're traveling alone, you're sure to make a few friends and there will likely be other guests around that you can chat with. The hostel has a range of amenities for guests. There is access to free wi-fi in the lobby, and there is a kitchen that guests can use to prepare their own meals. Every guest receives a free drink when they arrive and there is free luggage storage and secure lockers available. For an additional fee, you can enjoy an all you can eat breakfast buffet. The hostel staff is friendly and welcoming, and many of them are travellers themselves. They ensure that the hostel has a fun and social atmosphere and that it's easy for guests to meet. There is plenty of common space where you can relax and enjoy the atmosphere after a busy day exploring the city. This is a great place to base yourself during your time in Vienna. Hostel Ruthensteiner is conveniently located between Vienna's city center and Schonbrunn Palace. It's also close to many different restaurants and activities as well as the city's largest pedestrian street. It's a four minute walk from Westbahnhof train station. The hostel is a friendly place to stay with welcoming staff and a diverse group of guests. The hostel is run by a group of family and friends, so if you're looking to avoid the atmosphere of a chain hostel, then this is a great option. There is plenty of common space where you can relax after busy day exploring the city and make some new friends. The hostel has a range of amenities for guests including a book exchange, a full kitchen and barbecue area, beautiful gardens where guests can hang out, bike rentals, free wi-fi, and a casual bar where you can enjoy a beer. Breakfast is available for an additional fee. The staff can also help you arrange any number of activities or tours. Both private rooms and dorms are available. If you're traveling alone and want some privacy, there are single private rooms available. There are also twins, doubles, triples, and quads. Dorms sleep between six and ten people and female only, male only, and mixed dorms are available. This hostel is conveniently located between the museum district of Vienna and the 7th District shopping street. It's a wonderful place to stay if you're looking for a cultural experience that immerses you in the city's excellent art and music scenes. The hostel is simple but comfortable. It has 47 beds that include singles, doubles, and triples. There's also a breakfast room and a gathering room. Each room has single beds, a desk, and a sink, with shared bathrooms. Breakfast is available to guests for an extra fee. This hostel has the feel of a hotel, so it can be a little difficult to meet other guests, but it's a relaxed place to stay where you can enjoy a good night's sleep. If you're traveling alone and want a little privacy, there are private single rooms available. The price is very reasonable, and it has the comforts of a hotel. It's conveniently located, the staff is friendly, and the hostel is modern and clean. It's a good option for guests not looking for a party atmosphere. myMojOvie is a unique accommodation option in Vienna. The hostel offers private accommodation that is run by locals who are eager to help you experience Vienna in its entirety. Included in each booking is an apartment unit with a kitchen, internet access, complimentary breakfast, a book exchange, and luggage storage. Laundry services are also available. The hostel is just a short walk from the Museum Quarter and a twenty minute walk from many of the city's main attractions. It is convenient to all types of public transit including trams, trains, and buses. Many guests rave that this is the best hostel experience they've had. It's a great option for any traveler who wants to experience the city from a local's perspective. The staff go out of their way to ensure you have everything you need during your time in Vienna including travel information and restaurant or entertainment recommendations.